Bill T. Jones of Bill T. Jones/Arnie Zane Dance Company in Story/Time; photo Paul B. Goode. There’s a happily revolving door at Jacob’s Pillow every summer, as dancers and dance companies come and go and audiences have the chance to sample from hundreds of performances. The dance festival in Western Massachusetts, has now been running for 80 years, since Ted Shawn freed himself from a vaudevillian past, (and a dancer wife, Ruth St. Denis) bought an old farm on a hill in the Berkshire hills, and founded an all-male dance company. He brought together men recruited at Springfield College PE classes, and dedicated himself to the idea of promoting dance as a virile, athletic activity. His dancers built cabins and dance studios when they weren’t rehearsing, some of which are still in use today. Early on, they began offering performances to well-heeled audiences of New Yorkers and Bostonians, who summered in the cool, verdant hill towns of the area. In 2012, the Pillow is one of the most active presenters of touring dance companies in the US. Every week, a new batch of artists is seen onstage at the barn-like Ted Shawn Theatre, a smaller black box theater, the Doris Duke, and a stunning hillside platform where emerging artists and student dancers offer al fresco performances. More than three hundred performances featuring artists from Australia, China, France, Finland and American companies well-known and soon-to-be-well-known offer a variety show that would have made Ted Shawn very pleased. Sydney Skybetter’s group was moved to a small rehearsal studio, where folding chairs were lined-up and the audience limited to the first 50 or so who showed up to claim tickets. Watching his multi-part 2012 piece, For Want of Sleep, up close and intimately may have been a unique opportunity to watch costumes and dancers slowly becoming soaked in sweat, but it robbed the audience of the physical space that might have let the movement breathe and register over a distance. As it was, the piece, presented with a collage of recorded music by Johánn Johánnsson, Arvo Pärt, and Sxip Shire, was a flowy, circling suggestion of intimacies and partnerships, which didn’t ever ignite into anything engaging. Kristen Arnold, Kile Hotchkiss, Jordan Isadore and Barbi Powers were attractive performers, technically strong, but never breaking out of the lyrical blandness of Skybetter’s choreography. 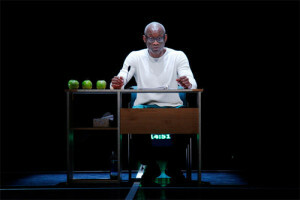 Bill T. Jones is touring the world with a new piece, Story/Time (2012) intended as homage to John Cage, the composer known most widely for his collaborations with Merce Cunningham, and his use of the principals of chance. According to the program notes, Cage’s 1958 piece, Indeterminacy featured no music. Rather, he sat by himself on a small stage, and read an “unbroken stream of one-minute stories.” Thus, Jones was planted center stage at the Ted Shawn Theatre, sitting at a desk lined with green apples, a digital timer flashing behind him, telling stories. For those who have followed the work of Jones (and Arnie Zane, his original collaborator, who died of AIDS in 1988) the idea that he might dispense with dancing altogether, just as Cage did with music, would not be surprising. Story/Time, however, had a lot of dancing. It wasn’t always easy to see, however, because Jones, with his magnificent voice and ever-fluent way with words, offered such a magnetic stage presence that was hard to stop watching him. Multi-tasking was called-for, but not easily accomplished. Stories ranged from memories of life with Zane (being called faggots when they walked down a street together by a man in a passing car), a conversation with a sushi chef at a Japanese restaurant, taking his grandmother to see the movie, Titanic and answering a post-performance question about what possible through-point Jones might have had in a career with such incredible variety (“Doubt, burns like fire,” he answered). Jones’ fine cast of dancers exemplifies not just the diverse approach he takes to his work, but his philosophy about dance. There are tall and short, black, Asian and white, thin and not-so-lanky dancers. All of them move with a consistently strong sense of physical commitment yet retain their individuality—each has a persona that adds to the stew of humanity that the choreographer is commenting on. Although Jones no longer appears regularly as a dancing soloist, it is clear that his movement approach and vocabulary continue to live, even grow. Janet Wong is listed as co-choreographer, and although she never appears alongside him to take a bow, clearly her movement imagination is helping to keep things fresh. Jessica Lang, who appeared with her newly formed company, Jessica Lang Dance, is a graduate of the Juilliard School, a veteran of Twyla Tharp’s company, THARP! and a prolific freelance ballet choreographer. While professional dancers (especially ballet dancers) rarely take the time out from their short-lived careers to attend college, the Juilliard School is an exception, offering students a degree as well as training in New York City with some of the top teachers and choreographers in the world. A high percentage of the graduates go on to careers in some of the biggest modern and ballet companies in the world. The Juilliard education features equal attention paid to both ballet technique as well as various styles of contemporary dance. Lang, and many of the dancers in her company, share that background—and the movement they embody has that blend of styles. It’s a look becoming more and more prevalent in ballet companies, where traditional pointe work and tutu’s are being cast aside for edgier explorations by people like John Forsythe, Jiří Kylián, and Nacho Duato—Europeans (or in the case of Forsythe an America who has made a career in Germany) all. Lang’s pieces were either so short that they didn’t explore the possibilities set-up by the use of props or costumes, or the use of props and costumes was something that gave Lang an excuse to fill up phrases of music with empty manipulations–not dance, not steps, not images. Lines Cubed, a world premiere for nine dancers, had sections named after the colors of the costumes the dancers wore, with the yellow section a perky daffodil-colored exercise in sprightly movement for three women, the red section featuring an Asian dancer, the blue section a slow and soulful (blue, get it?) movement, and so forth. The music, by John Metcalfe and Thomas Metcalf had a “modern” industrial sound to it, a clangy, rhythmic score that Lang filled with sharp kicks, robotic, jutting arms, and, regrettably, long sections of collapsible tubing, like accordion bellows, which the dancers folded, unfolded, hid behind and moved. The Calling, an excerpt from the 2006 piece, Splendid Isolation II, featured former Alvin Ailey dancer Clifton Brown in a dress. The striking imagery of the lengths of fabric spreading out around him like a pool of cream had the potential to offer an interesting voyage in movement, yet Lang decided to cut the journey short—the piece was a few minutes of gesture and the visual interest of Brown’s muscular back, facing the audience, but the excerpt ended before there could be any investigation of movement, use of the fabric, or exploration of the space. Solo Bach, (2008) was a happy, virtuosic dance for Shu Kinouchi, who was smiling and seemingly effortless in his quick jumps and turns. It was the sort of light, fluffy piece designed for galas, or summer audiences, where the mood is fueled by champagne or picnics, and the dance is designed to please–not think, not feel.